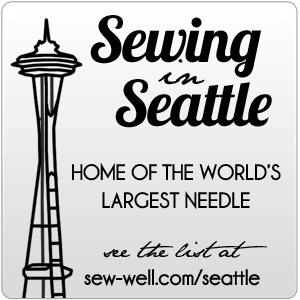 Jan Bones, of Sewing Lingerie, is one of my favorite instructors and pattern designers. She&apos;s practical, creative, and very pleasant. Her tips alone are worth buying her patterns, books, and taking her classes. She&apos;s saved me quite a bit of time and from mistakes. I was thrilled to see an article of hers, It Takes Two, printed in Sew News June/July 2014 edition. While I&apos;ve read the full article, I found that I&apos;ve kept the magazine nearby to read a paragraph here and another there, then re-read them as I have a few moments. I really appreciate the article because she&apos;s taken the time to share lots of her wonderful tips and tricks around knits. Jan&apos;s tips on preparing knits, stitching suggestions, and elastics are all things I regularly use in my sewing. There are several other interesting articles in the June/July 2014 printing. There&apos;s an adorable little summer satchel, with pockets reminiscent of your favorite jeans, that would be a great stash buster and perfect for your kids beach toys or for your beach trip needs: book, sunglasses and a towel. You can print the summer bag pattern here. Kay Whitt, of Sew Serendipity, wrote about sewing a lace dress. Get the pattern here. Have you seen her birds and flowers embroidered tunic, Willow? Oh. My. Gawd. Totally divine. The long nightie with the lace front shown on pages 70 & 71 is Jan&apos;s Nice Nightie pattern. I have yet to make this, but I really love the simple elegance. I really enjoy sleeping in my Nightie for Knits. For those who like Maxi dresses, imagine doing the Nice Nightie in a really wild, bright print with neon yellow lace. It is one of those patterns that can easily go from bed to ballroom. For those who prefer shorter lengths, the Nice Nightie can easily be done and work perfectly for a swimsuit cover up. How lovely to have a knit flutter at your thighs while you dry from a swim. So many fun nylon mesh prints that could be perfect for a swim cover-up and they&apos;d dry quickly. Have you sewn up one of Jan Bones patterns? Which of her designs do you love or lust over? Anyone interested in doing a sew along with a Jan Bones pattern?